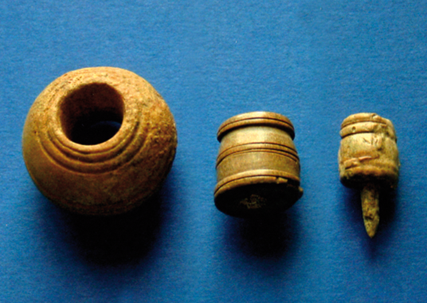 These gaming pieces were discovered during excavations at Cloghermore Cave, a long, narrow underground system 6kms east of Tralee, which yielded evidence of a Viking burial. Among the grave goods were a number of domestic items such as gaming pieces, weaving tools, beads and combs. The gaming pieces are from a Viking board game called hnefetafl. The game was played on a wooden board, and it centred on a king and his defenders trying to escape from a larger force. Holes on the board accommodated pegged pieces such as the one here, allowing the game to be played on the move.